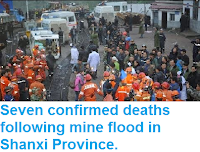 Sciency Thoughts: Fifteen confirmed deaths following explosion at Chinese coal mine. Fifteen confirmed deaths following explosion at Chinese coal mine. Fifteen miners have been confirmed dead and another eighteen are still missing following an explosion at the Jinshangou Coal Mine in Chongqing in southwest China. 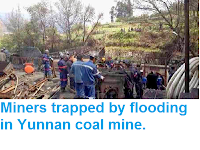 The incident happened at about 11.30 am local time on Monday 31 October 2016, when the mine was active and 35 men were bellow ground; only two of there were able to escape to safety. 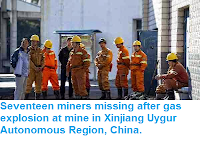 Around 200 rescue workers from a variety of agencies are said to be involved in attempts to locate the missing men, and operations at all mines in the area have been suspended pending safety inspections. 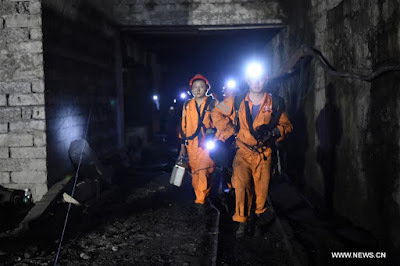 Rescue workers entering the Jinshangou Coal Mine in Chongqing following an explosion on 31 October 2016. Tang Yi/Xinhua. Coal is formed when buried organic material, principally wood, in heated and pressurised, forcing off hydrogen and oxygen (i.e. water) and leaving more-or-less pure carbon. Methane is formed by the decay of organic material within the coal. There is typically little pore-space within coal, but the methane can be trapped in a liquid form under pressure. Some countries have started to extract this gas as a fuel in its own right. When this pressure is released suddenly, as by mining activity, then the methane turns back to a gas, expanding rapidly causing, an outburst or explosion. This is a bit like the pressure being released on a carbonated drink; the term 'explosion' does not necessarily imply fire in this context, although as methane is flammable this is quite likely. The explosive range for methane is 5%-15% in air mixture. I wonder if these Chinese mines have adequate ventilation to dilute these high CH4 mixtures? Twenty six confirmed deaths in Egypt flooding. Asteroid 2016 UQ36 passes the Earth. Central Italy shaken by pair of Earthquakes. Understanding the ancestry of the European Bison. Asteroid 2016 UD passes the Earth. Queensland miner killed in trench collapse. Asteroid 2016 TO11 passes the Earth. Ancient fluvial systems on Arabia Terra, Mars. Asteroid (462959) 2011 DU passes the Earth. Understanding the ring system of J1407b. Asteroid 2016 TH passes the Earth. Eruption on Mount Aso, Kyūshū Island, Japan. Asteroid 2016 TD passes the Earth. Fireball over the Eastern Great Lakes region.